Portland Urban Wineries – what a treat! We only had 4 hours of free time in Portland and we were determined to make the most of our search for fantastic Pinot Noirs. That is how we uncovered that although Oregon’s wine country encompasses 16 specific AVAs and spans all the way down to California there are some fantastic urban wineries right in Portland. Oregon produces wine varieties from Albarinho to Zinfandel, which we will gladly return to taste, but that day we sought out the Pinot Noirs. Portland is easy to navigate with its 4 distinct quadrants. The airport seemed closest to Northeast Portland so we stayed focused to the East of the Willamette River and prioritized those that were open before 4 pm. First stop TeSoAria, all the reviews said this was one of the best and they are right. Since it was around 3 pm the tasting room was quiet and we had the luxury of meeting the founder and winemaker John Olson and his chef who was getting ready for the after work crowd. Yes we were focused on Pinots which we did taste, award wining and it was fantastic, but we also enjoyed the barrel cabernet and merlot blend. John gave us a great overview of wines in Oregon and promised that when we return he would gladly help us plan a 4 day tour not a 4 hour dash. 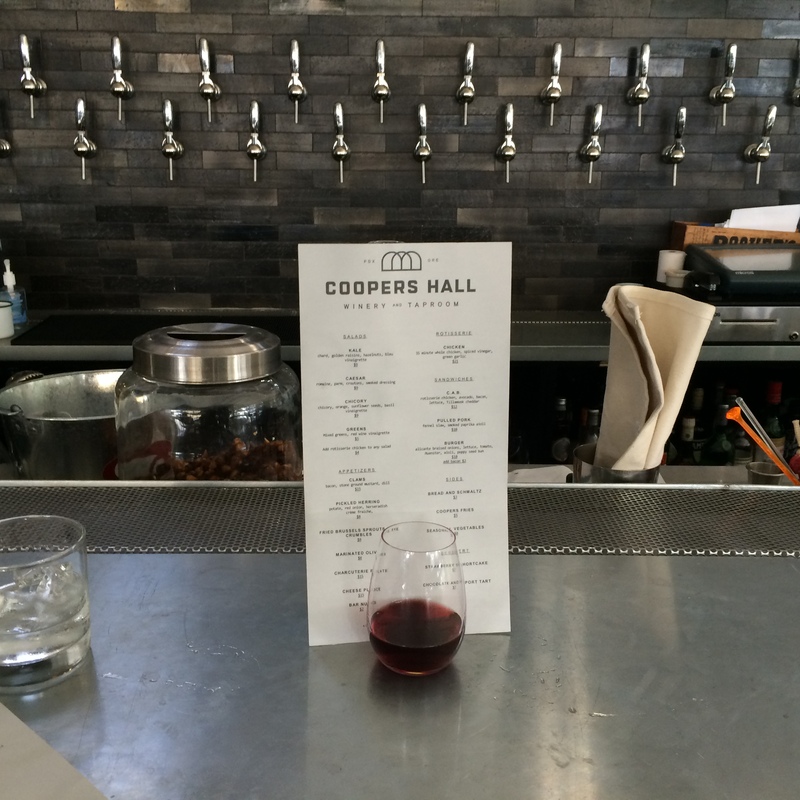 With only a few hours to spare and traffic starting to slow things down we dashed off to Coopers Hall which was only 4 blocks aways from Cyril’s at Clay Pigeon Winery. Great Choices! Coopers Hall is a great place, they were getting ready for a corporate event that afternoon on the top balcony level but we were always well attended and offered a chance to see all the barrels behind all those wine spouts on the wall. How cool! The tasting sizes were perfect for our goal of tasting variety. Less than 2 minutes away we stopped at Cyril’s where we had a delicious cheese plate and a large glass of a very smooth 2012 Clay Pigeon Winery Chehalem Mountains Pinot Noir. The outdoor patio looked like a lot of fun and the logo with the symbol of hands making a shadow puppet of a bird is very clever. There were so many more wineries we wanted to visit: ENSO, Hip Chicks Do Wine (great name) and others, but we had reached our limit of time as well as consumption in that short time. No doubt we will plan a more relaxing, 4 day tour with a driver! Categories: Travel, Wine | Tags: Clay Pigeon Winery, Coopers hall, Cyril's, ENSO, Hip Chicks Do Wine, PDX, Pinot Noir, Prtland, TeSoAria, Urban Winery, wine | Permalink. Love this blog! 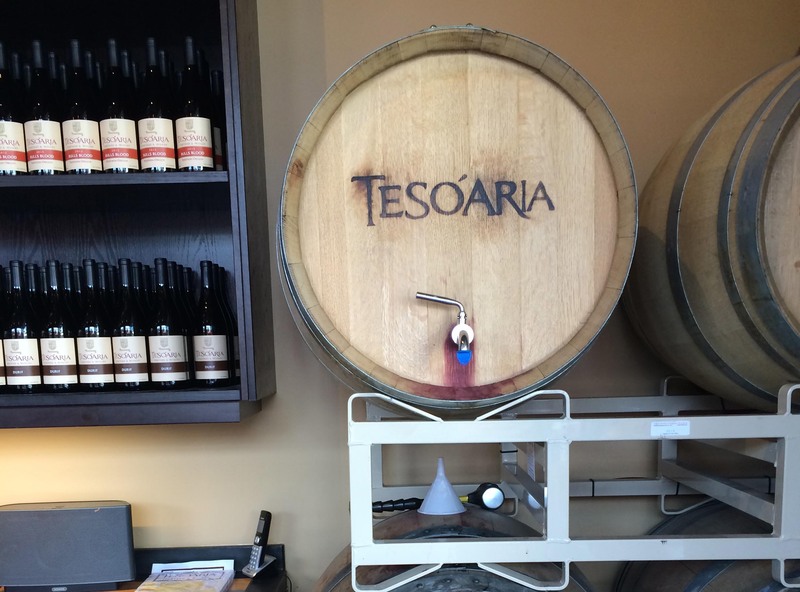 I had no idea Portland had wineries…another reason to visit Portland. Thank you weekend winos!